If your card isn't auto detected correctly, you have add the missing information to the driver when loaded. otherwise the driver is loaded before the command in /etc/modules.autoload.d/kernel-2.6 is launched. There is also a /hotplug/blacklist that should prevent loading modules, but it did not work. Check with dmesg | grep <driver name> that the parameters had been passed to the module. Analogue TV cards are replaced by digital TV, analogue TV cards can also be used to digitize analog video signals of some historic devices as vcr, tv cam, ... . Create a kernel with the bttv (BT848 Video For Linux) built as module, so you can pass command line parameters. If it is already loaded consider to unload it with rmmod bttv since the required arguments might not have passed. Not knowing the correct tuner makes the card unusable. 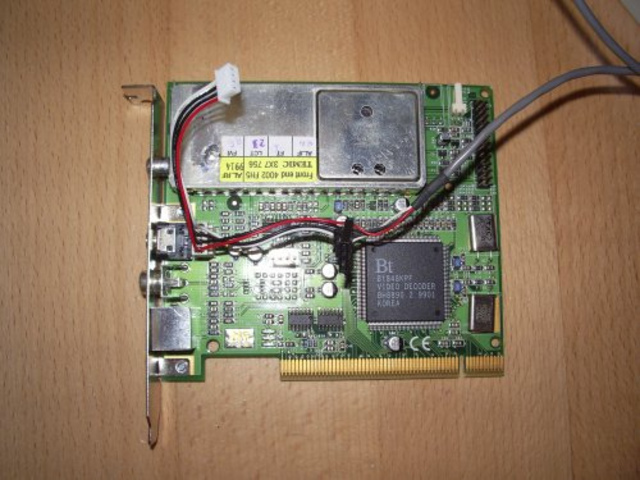 Audio can be supported by connecting an internal audio cable from the vt card to the motherboard as shown in the above photo or by plug-in externally a 3.5mm Audio cable into the tv card an feed it to the external line in socket of the PC's audio card. 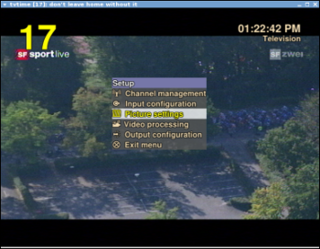 To checkout the card run as regular user mplayer tv:// -tvscan autostart and note a channel as channels=R6-ch1. Finally q brings you back. And to get the audio from the first alsa device hw.0,0 you need to enable the line input capture switch and set a good volume. Ctrl-c stops the well working mencoder, if it does not stop then something is wrong like the audio. Its internals are not auto-detected. Therefore it has to be done manually. If it is already loaded consider to unload it with rmmod saa7134 since the required arguments might not have passed. Not knowing the correct tuner makes the card unusable. in /etc/conf.d/modules to have the right command parameters when the file is loaded. However there is an other approach than /etc/conf.d/modules that loads kernel modules when they depend on others. It can happen that this loads the tv kernel module before /etc/conf.d/modules . To have also this approach using the correct parameters create a file /etc/modprobe.d/tv.conf with the line. This card is also detected as additional alsa cards, so check if your soundsystem is still working. Maybe it is but misses the loudspeakers on this tv card so it will be quiet. 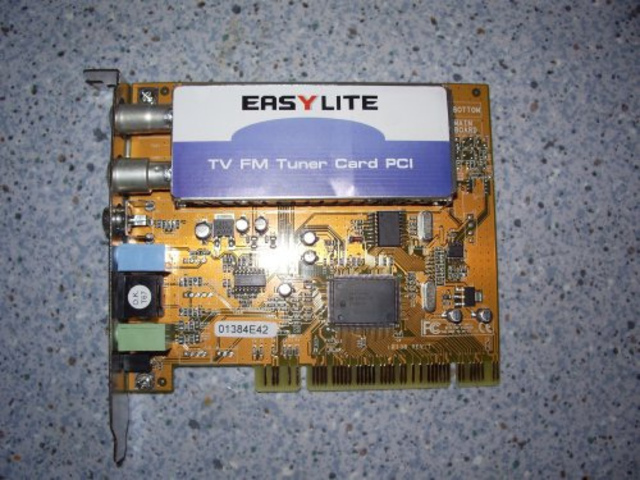 So test alsa and configure it to have the soundcard as card 0 and this tv card as card 1. To checkout the card run as regular user mplayer tv:// -tvscan autostart and note some channel as channels=R6-ch1,SR2-ch2. R6 is the channel ch1 is the name. Finally q brings you back. Cable between audio out of the tv card and audio in of the soundcard. This occupies the socket audio in of the soundcard, and puts the work when digitizing sound to the soundcard and not the tv card. It is also expected that the sound quality will decrease. Line in of the sound card where the loudspeakers are (where the sound level can be adjusted and also can be muted). Additionally there is the capture sound level used for recording, that also can be muted. There are so many parameters to be adjusted, that you can be lucky if it works as you wanted! In case of troubles (You are lucky if you don't have) replace the jumper cable with a headphone to listen what comes out of the TV card and on the other end plug in via jumper cable a MP3 player that pumps sound into the sound card, so you can determine, if the problem is with the TV card or the sound card or both. Use the alsa sound on the tv card. If not already loaded modprobe saa7134-alsa. If you do that or it has been automatically done, you add a new sound card to your computer, watch out that the sequence of sound card is not get messed up. See Alsa. The sound gets to the tv cards audio chip, but does not find the way to the soundcards loudspeakers. A way out is the following command that reads from the TV card, writes it into a buffer and that reads it out of the buffer from your sound card. It basically replaces the jumper cable. For the on board FM radio check that the module tuner is loaded and emerge fmtools that includes the fm and the fmscan application. Type fmscan and not how it finds station by printing their frequency and level to the screen. To listen type fm 99.8 to get the radio at 99.8 MHz with default volume. To have something nicer emerge gnomeradio. There is also the program radio that has a user interface in the console. It comes with xawtv. Since it does not find the radio type radio -c /dev/radio0. To record it is important to set the mixer input appropriate. In the mixer applications the red lights for line and capture should be on. The classic TV application is xawtv (so emerge xawtv) that has some not obvious and ugly user interface behavior. Arrow up and down select channels, mouse click left and right when mouse cursor is over slide bar increases and decreases (e.g. brightness). Capture in the pop up menu lets you select how the video comes to the screen, probably not all works so try out. Select some tv stations and save it, the result will be in ~/.xawtv, so next time it keeps up on running. If you like to have something less ugly lookingemerge tvtime or put a home theater application as vdr or mythtv or use the standard tv application that comes with your desktop environment. Or use mplayer on the command line or with some front-end. tvtime is a nice looking tv application that does not depend on the desktop environment. Configuration is done via menu as well as scanning the channels. Alevt is a standalone video text (VT) application (or teletext). Make sure the use flag zvbi is set, so also other applications will get video text support. Check that daemons such as nxtvepg or even other TV programs are not running, since they can obviously occupy the video text decoder circuitry in the TV card and therefore aleVT can not access it and will not work. Unfortunately aleVT does not give an error message in this case.